We are a leading Manufacturer of edta dipotassium from Panoli INA, India. With the inclusion of advanced technology, we are engaged in offering a comprehensive grade of EDTA Dipotassium10%. The offered EDTA dipotassium is used in metal plating, agriculture and electronics. The EDTA dipotassium provided by us is processed by our adroit professionals using optimum quality chemical compounds in sync with set industry norms. Apart from this, we provide this EDTA dipotassium in diversified packaging options at affordable prices. 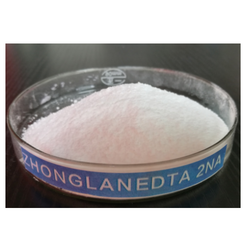 Looking for EDTA Dipotassium Salt 10% ?